​As a black not-yet-mother, but a pediatrician who has witnessed countless mothers in moments of uncertainty or grief or anguish or relief, I often imagine the identity shift that occurs with childbearing and all its attendant anxieties. In Pecking Order Homer examines the identity of motherhood from every messy angle – it is “alive and fortress and brick tenement and splintered treehouse” or “knife and whetstone” (“How I Became a Mother Contemplating Loss”). This emotionally packed debut collection dissects the complexity of relationships between mothers and their families, but especially between a black mother and her family with a white man. The first third of the book focuses primarily on the visceral experience of becoming a mother; the rest is preoccupied with how the racialization of family complicates the relationships within it, and how this in turn complicates a mother’s identity. Homer’s language ranges from conversational to hyperbolic and fresh. This has the effect of jarring awakenings punctuating a landscape of banal domesticity. “I was born dreaming I would die in childbirth,” the speaker muses in “How I Became a Mother Contemplating Loss.” What does it mean to be cut open, emotionally and/or physically, and survive? How does one survive that type of aperture and the losses, large and small, which result? The incredulity about this survival permeates Pecking Order. Homer comes to the conclusion, “[t]hat is the scariest thing: / that we do it anyway. The blood, the screams, the milk” (“How I Became a Mother Contemplating Loss”). We make ourselves vulnerable for children whose survival is never guaranteed. After all, “[m]y mother” knows that “I am alive and that could change at any moment” (“I Have Counted Sixteen and a Half Dead Deer on My Ride Home from Work”). Homer’s poems are at times sprawling, as in “Conception” and “How I Became a Mother Contemplating Loss,” and at times spare, as in “Why Didn’t You Just Go Look?” The sprawling poems are reminiscent of a stream of consciousness and at times feel almost disorganized. The speaker often jumps from thought to thought and back again, driven more by an internal lyrical force than narrative sensibility. This seems to be a deliberate formal choice, as it mirrors the disorganization the speaker feels in poems like “The Paper Trail.” In this poem the speaker admits that motherhood “is not what she pictured,” and its clutter of “soft squeaking toys and jagged gravel,” “the dishes, dirty and chipped,” and “crayons, pencils, papers” spills across the entire space of the page. In other instances the sprawling forms serve as a darkly comic exploration of the absurd questions levied at mothers with an audacity reserved, it seems, expressly for them. For instance, in “The Woman Who Is Not the Nanny Answers at the Grocery Store Concerning the, Evidently, Mismatched Children In and Around Her Cart,” Homer imagines a volley of snarky responses to a stranger’s prying questions about the speaker’s relationship to her children that feels righteously delicious. It’s the prolonged, imagined retort one dreams up hours after a confrontation. where I dare not place the adjective]? One-third of the way through the book Homer shifts her primary focus to the role of race in motherhood (although “The Woman Who Is Not the Nanny Answers at the Grocery Store Concerning the, Evidently, Mismatched Children In and Around Her Cart” introduces this aspect early on in the collection). In “The Mother Offers Advice (Or, I Am Doing the Best I Can With What I Have),” the speaker counsels her progeny, “[d]on’t never tell nobody who your mama is.” The rift that motherhood offers – to have a part of one’s heart in another’s body – is compounded by the ways in which a black body is made public in American society as “a field trip” or “a weapon.” The survival skills that mothers teach their children become more urgent when those children belong to an oppressed population. But Homer offers another angle of complication – that of a black mother’s heart in her white-passing child. In the poem “Ease,” she asks plaintively what it means for a black mother to have a “blue-eyed boy” when “[e]very day we will continue to look like kin who aint kin.” To what extent should we expect to be able to identify with our children? What is it like to mother when we don’t identify with our child(ren) in some core way? Homer’s speaker weaves in and out of these questions without ever quite landing on answer, which seems an impossibility. soft focus and stupid grin. as a way to connect with an ostensibly black secretary at work. The speaker nods, smiles, looks away, and thinks, “I know what you mean is not the same thing as / you’re right / or even, that makes sense.” The implication is that despite attempts to cross it, there might always be a gulf separating the speaker’s experiences from her husband’s understanding of them. Through the microcosm of a nuclear family, Nicole Homer employs the language and imagery of domesticity to ask questions that have much wider implications. In a nation, as in a family, how do we belong to each other? 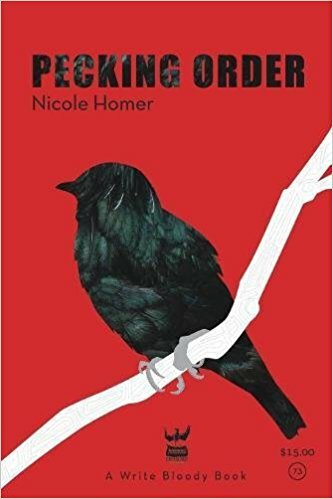 Pecking Order is a promising debut, which shines most when Homer dissects the small, daily moments of fear, separation, potential loss, and misunderstanding that punctuate motherhood and marriage in a nation built on white supremacy.